What Do You Want To Know About The 2018 Toyota Land Cruiser? 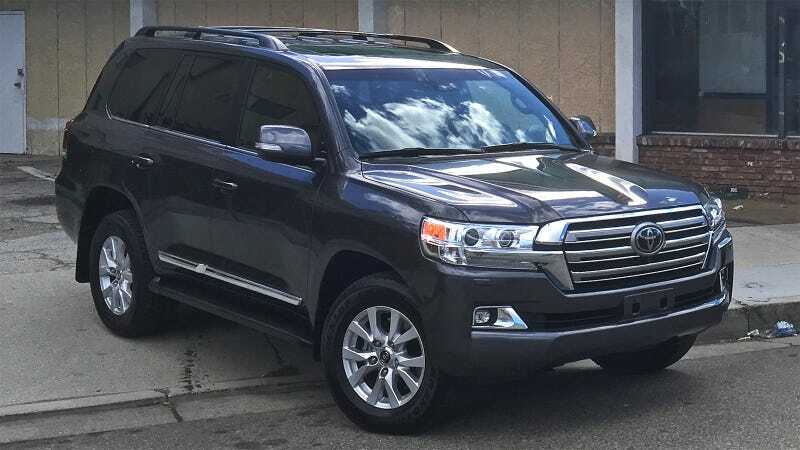 The 2018 Toyota Land Cruiser is the most expensive vehicle in Toyota’s lineup by a massive margin. This model’s sales numbers are so low that it’s unlikely you’ll ever see one in person in America. And yet, it still exists. This week we’ll find out why. Or, at least, whether or not it deserves its strange invincibility. On paper, the Land Cruiser is a pretty straightforward SUV. Frame-based body, big V8, four-wheel drive. There are no packages, there are no trim levels. The 5.7-liter engine is rated at a modest 381 horsepower and 401 lb-ft of torque. But once you look a little closer, the $85,000 list price starts to make a little more sense. The Cruiser’s interior is bristling with buttons. The seats are super-plush, and somewhere inside the truck’s guts below all those complicated looking controls are advanced off-road systems including a terrain-monitor camera with a built-in inclinometer, constantly auto-adjusting suspension, an off-road cruise control and an advanced terrain-responsive traction control system. Did I mention our test vehicle has seating for seven and iPad-sized monitor screens for the second row? In 2017, Toyota reports that it sold 3,100 Land Cruisers. For a little context there: Chevy sold 56,516 Suburbans in the same period of time and Jeep sold 190,522 Wranglers. And yet, as we’ve established, the Land Cruiser lives on! In other parts of the world, or at least, in Australia, this vehicle enjoys legendary status as basically the best thing on four wheels. Plenty of off-road enthusiasts will tell you the same thing stateside. And so will anybody trying to sell you one. Go ahead and check Craigslist for used Land Cruisers... they’re tough to get a good deal on. Interestingly, Toyota’s consumer website says there are 25 Cruisers for sale on dealer lots near me in Los Angeles. So I must be in a hot bed of the things. Anyway, I’m taking the truck to Death Valley so you’ll get a pretty complete shakedown with highway driving, city driving, and of course some off-road action. Let me know what you’re curious about, and I’ll try to answer questions here and in the review!